LaMarcus Adna Thompson is widely regarded as the Father of the American Roller Coaster. Thompson invented and built his pioneering Switchback Gravity Railway at West Brighton, Coney Island, in 1884. 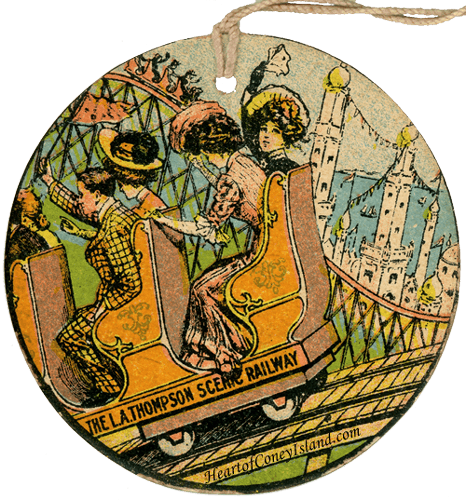 Subsequently, he developed the concept of the 'scenic railway' and built a large and successful company that operated dozens of these rides across the world. 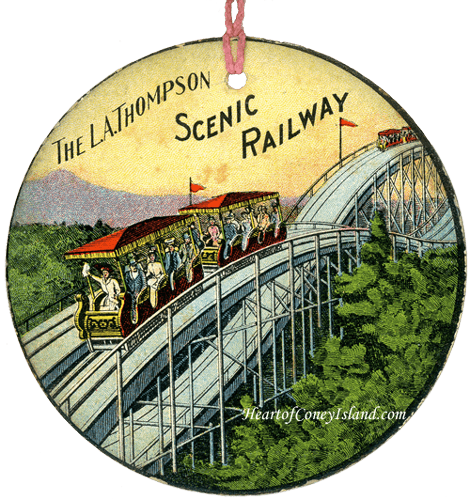 Thompson's Switchback Gravity Railway is the precursor to modern roller coasters. Passengers climbed up stairs and rode a gravity-powered cart very slowly down tracks at roughly 6 miles per hour. They faced out instead of forward so that they could take in the surrounding scenery. At the bottom, the passengers would get off, attendants would push the cart up to another set of tracks (hence the name "switch-back"), and passengers would get back on and ride back to the starting point while facing the opposite direction. Competition quickly forced Thompson to improve his initial Switchback Gravity Railway, leading to his popular 'scenic railway' concept. What exactly is a 'scenic railway'? Think of the "railway" component as a gravity-powered, slower version of a modern roller coaster. The 'scenic' component originally meant that you had a scenic view of the surrounding area as you rode, just like that offered by the Switchback Gravity Railway and the competing Shaw Channel Shute. 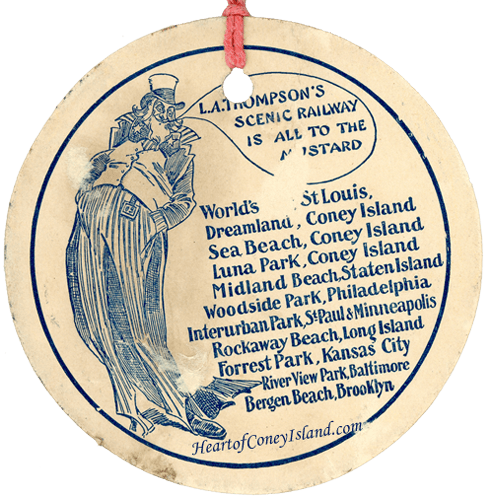 Views were a big deal because there were no tall buildings back then, so people would pay to go up in Ferris Wheels or the Iron Tower at Coney Island for panoramic views. 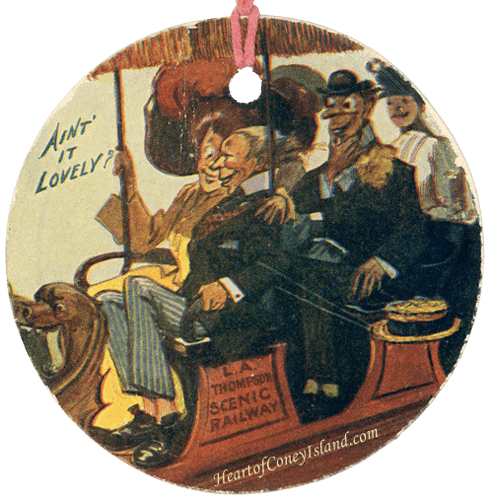 However, Thompson came up with a clever twist on the 'scenic' aspect, and developed into rides that simulated trips through foreign landscapes like the Swiss Alps or Venetian Canals (both, at Dreamland) using elaborately painted backgrounds and montages. 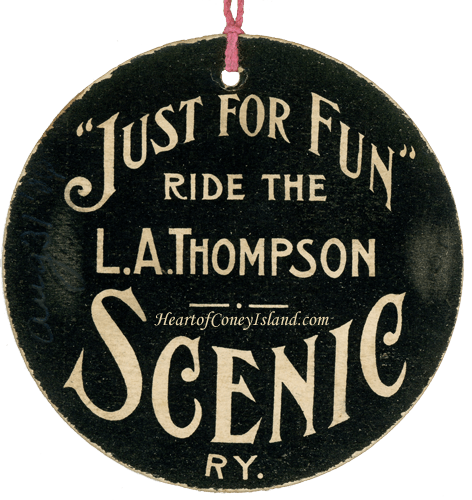 These rides became incredibly popular at a time when photographs of foreign places were rare and very few people could afford to travel abroad. The Dragon's Gorge at Luna Park, shown in this photo above, is a great example of the pride that Thompson took in his scenic railways. 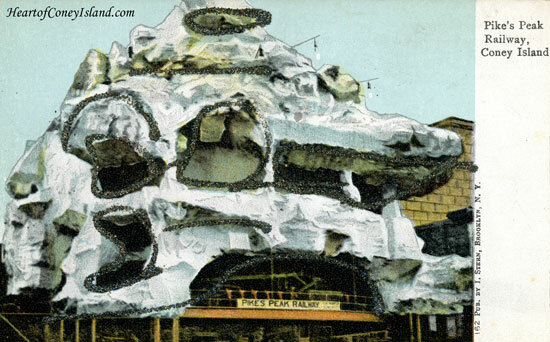 This ride was active at Luna Park from 1905 until 1944, and has the distinction of surviving Fred Thompson's (no relation) and Skip Dundy's annual spring cleaning during which they would remove any ride at Luna that hadn't paid for itself the prior season. 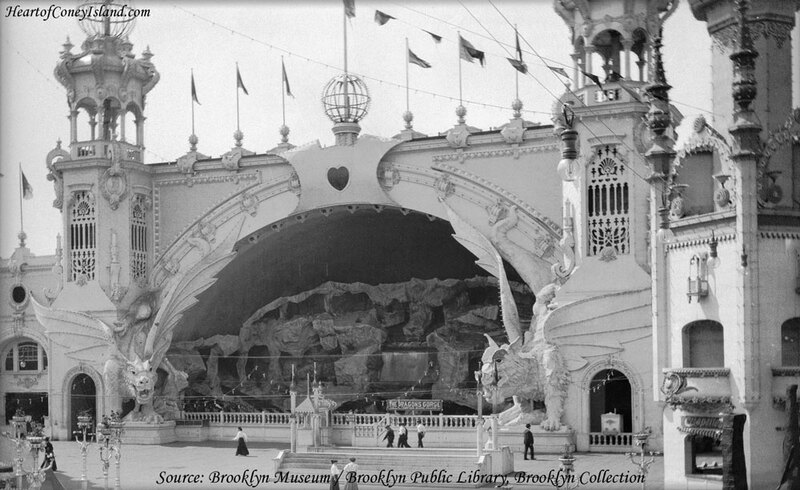 The Brooklyn Museum describes the Dragon's Gorge well: "The Dragon's Gorge was an enclosed roller coaster, a scenic railroad that brought the passenger on a fantastic trip from the bottom of the sea, through a waterfall, to the North Pole, Africa, the Grand Canyon, and even into Hades, the kingdom of death, over the river Styx. Two dragons framed the entrance, their eyes glowing from globes of green electric light." Remember, special effects using electricity were a big deal in 1905! As roller coasters became faster, Thompson stuck with his scenic railway gameplan instead of pursuing the thrill aspect that we associate with modern coasters. He'd market his rides as "safety" coasters to highlight that the faster rides were less safe. But, like Edison found out when using a negative-marketing campaign against Tesla's AC electric power, this can only work for so long. His rides remained popular until the early 1920s, when fast roller coasters became safer following several inventions. By then, people were also able to travel in cars, so slow rides lacked thrill. L.A. Thompson's company was large enough that it standardized some tickets for use across the country, like the ticket at the right. It's actually from a series of similar tickets where there's something slightly inappropriate going on. All three of these specific tickets were from Coney Island based on the other items found with them. 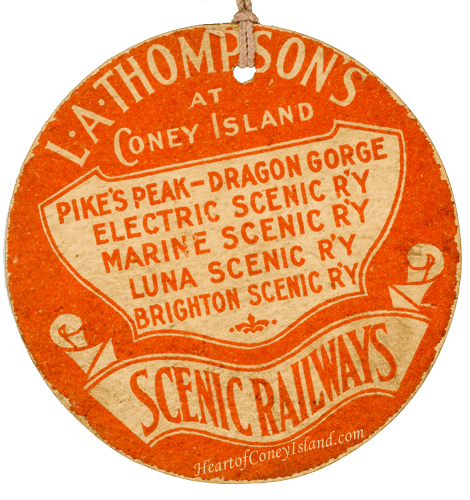 The ticket at the left is of particular note because it specifically ties it to Coney Island and the six scenic railways that L.A. Thompson had there, including Pike's Peak and the Dragon's Gorge. Lastly, while the postcard of Pike's Peak is rather ugly, it shows just much Edwardians loved outlining things in glitter. If you haven't checked out the Vintage Postcards section of the site yet for a nicer selection, give it whirl.